A nice toy! I'm loving Palm's too (also PocketPC's! , but will "Chess Tiger" (or the other Palm-chess programs) run on it? And the battery time is much too short! If you have to recharge it every day, how long will the accu survive this? And is it replaceable? I actually asked the support from Chess Tiger and they confirmed it would run on it! I am "this" close to getting one! I know the ELO rating wouldn't be all that great based on the processor speed but I still think it would be really cool to play chess on a watch! Especially when you're on a trip or in line! Yes, battery like is really not that great but from I have heard from others it doesn't seem to an issue if you recharge it regularly. Some have to charge it every other day. If I do get it, you'll see a post here! Where is the human that thinks he can play chess? Funny you mentioned the wrist watch! I'm trying my best not to buy it, especially now that the price is down to about $150.00. You are going to get one of these old fossils eventually. I think that at 100 bucks it will be irresistible. The match schedule cannot help. Wednesdays game was tough, and to come out and face Hydra with the black pieces the next day must have been difficult. But Mickey's a hardened pro. He seemed relaxed in the Q&A session after Wednesdays game. When I used to play in tournaments I found them similar to taking exams. At the end of a hard game I felt mentally exhausted but on a high. Mickey looked like it was just part of a days work. Apparently this prediction comes from John Nunn, one of the strongest English GMs of his day, and once in the world top ten players. A brilliant mind. I think it just about sums it up. Many commentators are attributing Adams match situation to a combination of errors, tiredness, choosing the wrong openings, poor preparation and various other excuses. I very much doubt if Mickey would use any such reasoning. It is just a case that a 2750 Elo player is getting a beating from a 2900-2950 Elo player, and exactly the same fate would await any of the worlds top ten, with the possible exception of Kasparov. Hydra is now much faster and stronger than it was just a year ago and there are further improvements planned. John Nunn is making a joke of it but he is just confirming that the Machine has overtaken Man and is now disappearing into the distance. 2008 Leading GM loses to Ismenios wrist watch, on time. Mike, I was just typing my previous post when you posted your reply. I think the schedule is unfair and that Mickey should have more time to rest. There�s good reading on their official site as well. Can you say something about the Hydra-chess-evaluation? Basically it is a dynamic evaluation. Dynamic evaluation means: An extended move generator is called for both sides. One can calculate from this information simple things like mobility (number of legal moves for each side), but also more involved ones like king-attack, pinned pieces, center control... There are of course some terms for pawn-structure and passed pawn. But the dynamic part is the most important one. Dynamic information is expensive to calculate in software, it is relative cheap/fast in hardware. The Hydra-FPGA needs only 2 clock-cycles (but not at 3 GHz, at mere 55MHz). This full dynamic information differentiates Hydra from the PC-programs. They have a dynamic evaluation too, but on the PC one has to implement a compromise between speed and evaluation accuracy. I have to confess that when I had a chance to see Kasparov vs Deep Junior I was kind of cheering for Jr � no rational here, can�t explain why! But in this case I really hope Adams wins! I think he can still do it but I�m concerned about his mental state at this point. 2009: Leading GM loses to his mobile phone, which plays a rude ringtone every time he makes a mistake. 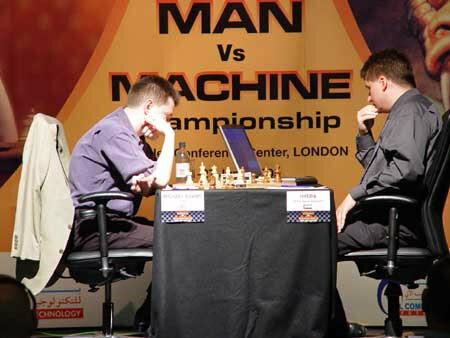 2011: Leading GM loses to his son's LEGO toy. The message that comes across from them sounds very confident, if a little arrogant. But I like his style, he produces very interesting games. You are right about Hodgson not being the sort of player at his best against a computer. Hydra though is probably over 2900 Elo now and its developers stated target is to surpass 3000 Elo + by the end of 2005. One interesting point made by both Ulf Lorenz and Christopher Lutz was that they have deliberately restricted the opening book to a maximum of 10 moves. Their reasoning is that relying on Grandmaster chess to go deeper down lines actually reduces the strength of Hydra. Hydra is more likely to handle any resulting position better than a GM in their opinion, at least as far as Hydra's characteristics are concerned. They also believe that they are uncovering better moves than established theory. Well that is what they said. 8 lucky(?) souls are playing Hydra today. Apparently I was one of 200 who registered for a game. Hydra escapes again. I have been under the impression that the best approach in beating any chess computer was to play "non-book" chess. Play good moves, but get the computer out of a "comfort" zone very early in the opening. Am I mistaken? I certainly am not in any position to question what you say about anything chess related, but I have seen this mentioned several times in various forums. My real interest in finding out the answer is so that I can finally win a game against one of my Fidelity CC1's! One comment by Julian Hodgson gave me food for thought. He was asked in a jovial manner how he thought he would fare against Hydra? His reply was that in a 6 game match he would lose all 6. In all seriousness he explained that you needed to be a Super GM to stand a chance of a draw against a computer of this strength. Perhaps only a player in the top 10 or 20 in the world. Hodgson is still rated over 2600 Elo and was 2640 at his best. When all is said and done Ismenio you have to admit one thing? Spocks chess set is beginning to look a bit rickety. I think I know what you mean Mike. Sometimes I even wonder about the psychology of this whole thing. Imagine what the expectation must be. No pressure here, you just have a good portion of the planet watching you playing against a machine! At the same time, there are the programmers and those involved in developing the technology that made it possible for computers to really challenge us. I think a lot can be said here even going beyond a game of chess. What can you tell about the audience? I thought it was interesting to see such a diverse audience in Times Square. We had kids, some more older, experienced folks and a lot of different people in between. Your Accoona event sounds and looked like a thoroughly enjoyable event. Thanks for the pictures. So Rustam Kasimdzhanov has a twin brother? Michael Adams v Hydra is deadly serious stuff, I didn't realise how serious until I got there. I have been to a few big tournaments in London in the 1980/90s between the top players but there was an atmosphere of a sporting contest at those. This was more Machine eats Man. 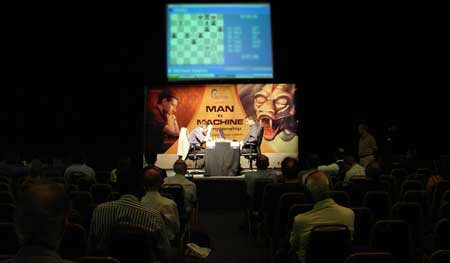 The audience were chess players and press all watching intently in virtually complete silence. All very different from your chess event but enjoyable in its way. Mickey approached the game with an air of grim determination. He only left the board for 2 minutes that I saw and was otherwise calculating non stop for the 6 hours the game lasted. In the question and answer session afterwards he said he had chosen the time regime to give himself the maximum time available in a game that has to be finished in one day. 100 mins for 40 moves plus 30 secs a move etc. Obviously the quicker the game the bigger the advantage to Hydra. It made me think that contests like this, at the top level, will soon be a thing of the past. When I first got interested in computer chess David Levy was challenging programmers to produce a program which could beat him, and winning all of the bets that were put up. Now we are reaching the point where any match between a human and the strongest computer will be a foregone conclusion and will attract little interest or sponsorship. Nobody is going to put up big money for a match against a second class computer. It will be a triumph of mans genius and determination that chess computers have reached this point but in my opinion a little sad as well. Which probably explains a bit why I prefer the Oldies. Thanks for that report Mike! Much better than mine! Also, I liked that you had headphones to listen to the commentaries! Great idea! So you were in the same room where the game was being played? What can you tell about the audience? I though it was interesting to see such a diverse audience in Times Square. We had kids, some more older, experienced folks and a lot of different people in between. Well things went OK for Michael Adams today, with a hard fought draw. Just got back from a gruelling one hour drive from Wembley, Ismenio. Not a particularly well attended event, no doubt there were more people there yesterday. Only 30 or so, most of the time, today. The event is well presented with excellent commentary via headphones. The commentators were UK Grandmasters Stuart Conquest, Jon Speelman and Julian Hodgson plus Christopher Lutz, the German GM who is the chess expert on the Hydra team. Playing with white Mickey had the edge out of the opening well into the middle game. The GMs still liked his position when Lutz told them that Hydras evaluation had reached plus 1.00. They began to waiver and after a few more moves Mickey was clinging on, without apparently doing anything wrong. Attending the event you got a real feeling that Hydra is a relentless opponent that would grind down any human opponent. Its game seemed totally without error and some of the moves were surprisingly subtle, increasing the pressure all of the time. Chrilly Donninger, the programmer, was there a few seats down from me getting a little agitated when the draw offers were being made, by which time Hydra was the exchange up but making no further progress. Mickey said he thought that offering up the exchange and setting up a fortress was the best way of bringing the game to an end. Poor old Mickey having to face this opponent four more times with only one rest day. I read this too...well we should not underestimate Ruud..we both know perfectly well what he is able to do. But: this will be a computer one can only loose against...do we really need this? Well I hope Mickey does better tomorrow or I may have to come to his aid. the move Mickey plays 23.....Rc7 leads to the loss of a pawn with apparently no compensation. Not a situation to be in against Hydra.